Hip resurfacing is a technique designed to reline the worn out joint, instead of being replaced completely as in total hip replacement procedure. In hip resurfacing the femoral head is not removed, instead it is trimmed and resurfaced with smooth metal covering. Hip resurfacing creates bigger hip ball than generally used in hip replacement, which reduces the risk of dislocation. Hip resurfacing provide active and improved quality of life which is done by restoring functionality to the hip through replacing damaged bone and cartilage while preserving natural bone as possible. The companies in hip resurfacing market are mainly focusing on geographic expansion, launch of innovative products according to the customer needs to gain larger market share. The Manufacturers are focused on developing new resurfacing implants with minimally invasive procedures. As stated by Persistence Market Research, the global hip resurfacing implants market is expected to grow at a sluggish rate during the period of assessment. The global market for hip resurfacing implants is expected to grow at a value CAGR of 2.7% throughout the period of forecast, 2017-2025. The global market is estimated to reach a valuation a bit less than US$ 200 Mn by the end of the period of forecast (2025) from a value of around US$ 160 Mn in 2017. Aspects such as recall of resurfacing implants and rising failure rates causing reduction in hip resurfacing volume have resulted in reduction in the revenue growth of the market in the current scenario. The material type category is one of the major segments of the global hip resurfacing implants market. 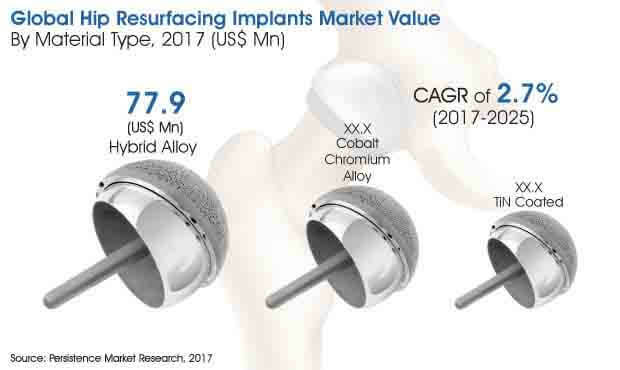 In this category, according to the research analysis, hybrid alloy and cobalt chromium alloy material both are being used on a large scale in hip resurfacing implants. The cobalt chromium alloy segment and the hybrid alloy segment, both are projected to grow at the same pace in the years to follow. These segments have witnessed great adoption in the recent years as compared to the tin coated segment. However, hybrid alloy segment enjoys a higher market share compared to cobalt chromium alloy segment and is estimated to reach a market value of about US$ 97 Mn by the end of the period of assessment, thus dominating the global market in the coming years. Cobalt chromium alloy segment is expected to reach a market valuation of about US$ 60 Mn by the end of the period of assessment and is the second largest region in terms of value. In terms of volume, the hybrid alloy segment is poised to register a volume CAGR of 4.9% during the assessment period. With respect to volume, the cobalt chromium alloy segment is anticipated to grow at the highest rate. The cobalt chromium alloy segment is expected to portray a volume of about 19 Bn units by the end of the year of assessment and is projected to grow at a high volume CAGR of 5.3% throughout the period of assessment.